Hogarth, William (1697 London 1764). 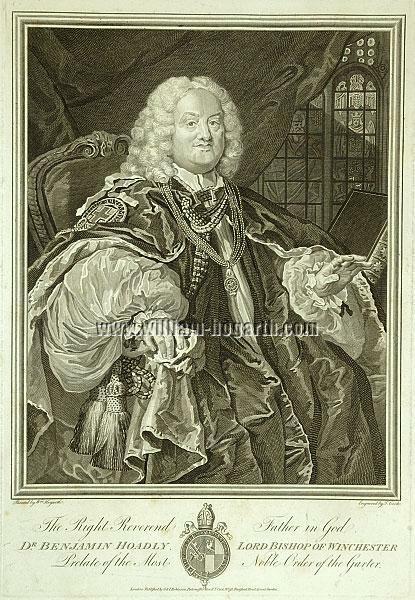 Dr. Benjamin Hoadly Lord Bishop of Winchester. The Right Reverend Father in God. Prelate of the Most Noble Order of the Garter. Three-quarter portrait, sitting, laterally to the right. “In grand style, though rather in the French manner” (Nichols). Engraving by Thomas Cook (c. 1744 – London 1818). (1795-1803.) Inscribed: Painted by Wm. Hogarth. / Engraved by T. Cook. / London: Published by G. & I. Robinson, Paternoster Row; & T. Cook. No. 38, Tavistock Street, Covent Garden., otherwise as above. 16¾ × 11⅝ in (42.4 × 29.5 cm). Marvelous impression of this beautiful portrait in rich chiaroscuro on strong paper. In its wide white margins as well as in the text margin some slight foxspots. – Cook “made his mark as Hogarth engraver, too, whose complete work he has engraved in copy” (Thieme-Becker) and whose original format he maintained contrary to all later Hogarth editions in his first, earlier edition. 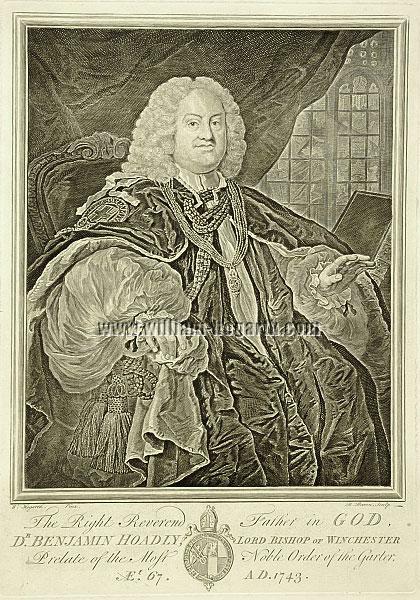 For some sheets not published by Hogarth himself Cook became their first engraver, just as he also gained approval of a contemporary connoisseur as Maximilian Speck von Sternburg. – – – The same in etching by Bernard Baron (Paris c. 1696 – London 1762) in a harmonic, wide-margined impression on strong paper from the plate retouched by the royal engraver James Heath (1757 London 1834) about 1822 (“Even these impressions have become relatively rare today though”, Art Gallery Esslingen 1970; and Meyers Konv.-Lex., 4th ed., VIII , 625: “A fine edition”, esteemed also already by contemporary collectors of the rank of for instance an A. T. Stewart [Catalog of the Stewart Collection, New York 1887, 1221, “fine plates”]). Inscribed: W. Hogarth. Pinx. / B. Baron Sculp., otherwise as above, but with the addition “Æt. 67. A D. 1743.”. 16⅞ × 11⅞ in (42.9 × 30.1 cm). Illustration Hogarth Catalog Zurich, 1983, 84. 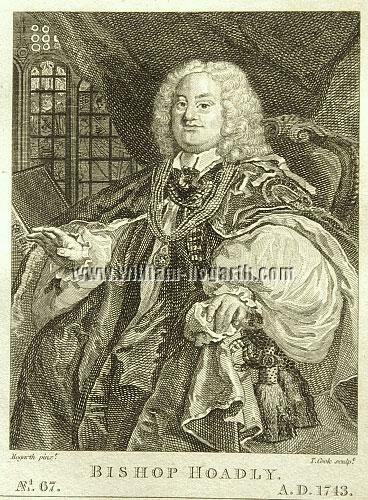 – Pupil of his stepfather Nicolas Henri Tardieu, Baron purchased “the copyright for W. Hogarth who entrusted him between 1738-50 with the reproduction of some of his most important works; this right B’s pupil L. Sullivan continued to use” (Karin Sagner-Düchting, Allgemeines Künstler-Lexikon VII , 123). – – – The same in reverse in Cook’s popular later, smaller version. Inscribed: Bishop Hoadly. / Hogarth pinxt. / T. Cook sculpt. / Æt. 67 / A. D. 1743. / Published by Longman, Hurst, Rees, & Orme, Jany. 1st. 1809. Subject size 5 × 4 in (12.7 × 10.3 cm). – Trimmed within the extremely wide white platemark.